The history of Christ Evangelical Lutheran Staunton, VA is one that has enriched the area bringing the Dutch, Swede and German culture and traditions to Staunton and Augusta County. It played a major roll in the development of the area in the mid 1800’s. The History Page is under construction. Additions to this section will appear as they are ready to post. The Lutheran religion found it’s way to the United States by the Dutch colonists of Manhattan in 1623. The first Lutheran pastor came to these shores, and the first Lutheran congregations were organized among the Swedes in Delaware in 1639. Other Lutheran groups came later. More than 200 years passed before Lutheranism found its way into Staunton. While there were Lutheran congregations in Augusta County as early as 1785, the history of the Lutheran Church in Staunton dates from the year 1843. In that year, a little band of Lutherans, living in Staunton, opened a Sunday School in what was then the old Bell Tavern on the southwest corner of New Street and Court House Square. The members of that group were: Abraham Venable, (deputy sheriff and county jailor), Bell Graves, Carrie Pickering, Elvira Davis, Col. George Baylor and his two daughters, and Mr. and Mrs. Henry When. Very soon Mr. and Mrs. Frank Prufer came from Saxony, Germany, and with David Bucher and his three sons, joined the Sunday School. After meeting about two years in Bell Tavern, the Sunday School moved to the Masonic hall where they remained until organized into a congregation by the Rev John B. Davis who was doing missionary work in this part of the Valley in 1853. Upon the congregation’s organization in 1853, Missionary Davis was called and became pastor. 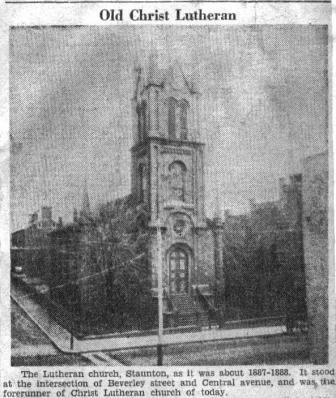 Under his leadership assisted by Col. Baylor, Absalom Koiner and George Shuey, who with the pastor canvassed the valley for funds, and with some help from the Evangelical Lutheran Synod of Virginia, a church was built on the corner of Main and Water Streets (now Beverley and Central Ave.). The residence of Dr. N. Wayt of Central Ave. adjoined the corner property was bought to be used as a parsonage but was soon sold. By the following year, the building was far enough along for the congregation to occupy the basement. They had not been in it long before the great flood of 1854 came throwing the clock tower nine inches out of plumb and damaging the walls. To avoid a repetition of this, a stone wall of great thickness was built on the water side of the church.